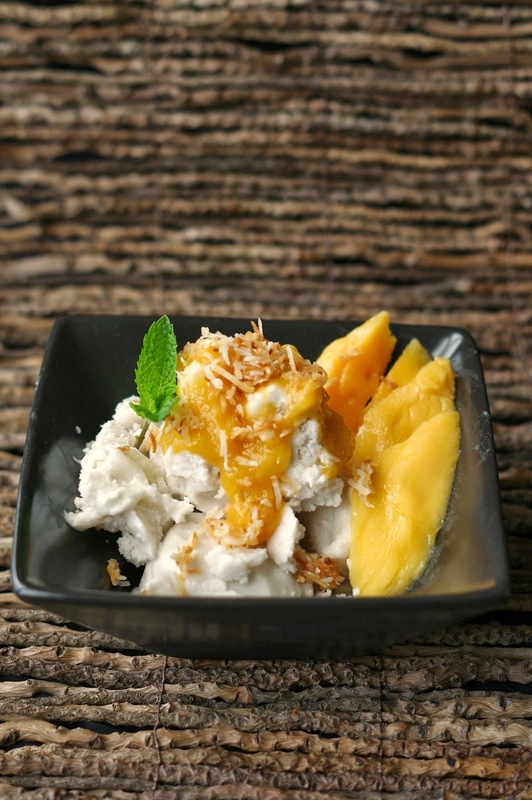 It's not a pavlova or a lamington but I still think this Coconut Gelato and Mango would make a great Australia Day dessert. Although if you are after something with a more traditional twist you could also try my Chocolate and Coconut Layer Cake . I think Mango is quintessentially Australian. It's bright colour, fresh smell and sweet taste sums up an Aussie summers for me and when it is paired with this coconut gelato it makes for a refreshing dessert. And if you squint your eyes and use your imagination it could just pass as green and gold!?! If you don't have a ice-cream machine you can still make it up and then freeze it in a lined loaf tin. Glucose syrup is easily available in the baking aisle of all major supermarkets and is a handy ingredient to keep tucked away in the back of the cupboard. It is best served on the day it is made as it does freeze very hard - so be sure to remove it from the freezer for a good 30-45 minutes before you wish to eat it! Preheat oven to 180 degrees. Spread shredded coconut over an oven tray and cook, stirring occasionally, for 4 minutes or until golden. Combine sugar and 2/3 cup (160ml) water in a saucepan. Bring to the boil over high heat, then cook, stirring, for 3 minutes or until the sugar dissolves. Remove from heat and stir in glucose syrup. Pour mixture into a bowl and and stir in lemon juice and zest and toasted coconut. Freeze for 15 minutes to cool. Strain coconut mixture through a sieve pressing coconut with the back of a large spoon to extract syrup. Reserve coconut for serving. Add coconut cream to syrup and whisk until combined. Churn mixture in an ice-cream maker until frozen. Cut one mango into slices. Place the flesh from the second mango into a food processor and blend until smooth. 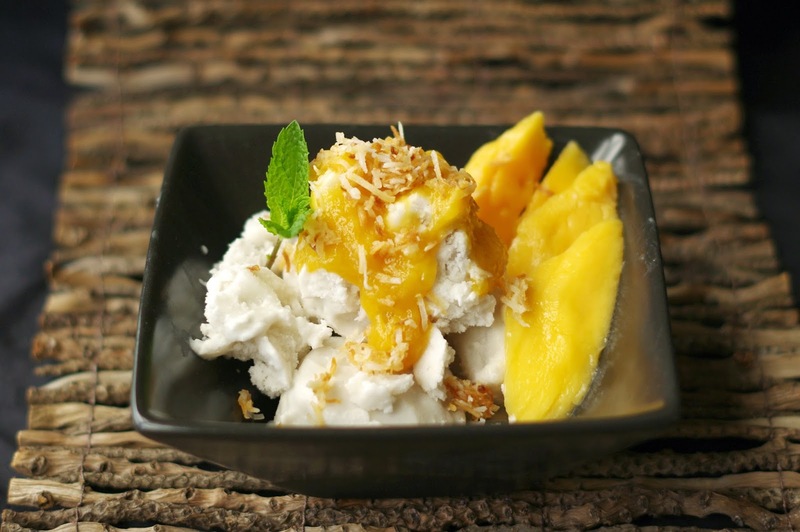 Serve coconut gelato with mango slice, puree and garnish with mint. What have you cooked up for Australia Day celebrations? Thanks Bec, it tasted pretty good too, well what husband left for me to taste anyway! Yum Yum! love coconut. What is glucose syrup though? Would that be equivalent to a light corn syrup? Or even a simple syrup? You're photos are beautiful! And oh my word! I haven't even had breakfast yet and after seeing this, all I want is this gelato :) Yummm!! !